The KitchenAid KHM926CU 9-Speed Hand Mixer with Turbo Beater II Accessories, in contour silver, offers endless opportunities in one hand-held appliance. It features the powerful but lightweight and quiet DC motor, plus a soft-grip, non-slip handle and a non-tip heel rest. It has the self-cleaning, stainless steel Turbo Beaters II designed with an oval shape and no center post to permit thorough mixing of heavy, dense ingredients without clogging. It also has the Pro Whisk to maximize the volume of air in mixtures for extra-silky icings, fluffy whipped cream and egg whites whipped to stiff peaks. Two dough hooks make easy work mixing yeast bread dough and the blender rod is perfect for creating creamy milk shakes or smoothies. The lockable swivel cord keeps the cord out of the way while in use for either a left or right-handed operator. Plus, the Soft Start electronic control starts slow to minimize flour puff and splatter for less mess. Kitchen Goods, a unit of Dominant Systems Corporation, uses sophisticated crawler software to search the web looking for great product deals online. For this page, related items include products we find that match the following keywords: "Hand Mixer" at our vendor partner Home Depot. 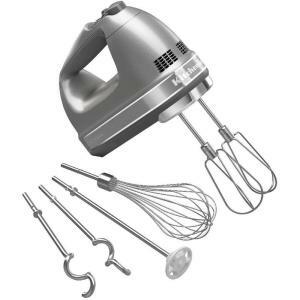 KitchenAid 9-Speed Contour Silver Hand Mixer is one of 20 Hand Mixers and related products available for sale through Kitchengoods.com, If you have any questions on this product, please give us a call at 734-971-1210 during the hours of 9am - 5pm EST for assistance. Thank you for shopping at Kitchen Goods, your place for kitchen gadgets, and more!